Describe a nonpolar bond and a polar bond. Use electronegativity to determine whether a bond between two elements will be nonpolar covalent, polar covalent, or ionic. Describe the bond energy of a covalent bond. Because the nuclei of each H atom contain protons, the electrons in the bond are attracted to the nuclei (opposite charges attract). But because the two atoms involved in the covalent bond are both H atoms, each nucleus attracts the electrons by the same amount. Thus the electron pair is equally shared by the two atoms. The equal sharing of electrons in a covalent bond is called a nonpolar covalent bond. There are two different atoms involved in the covalent bond. The H atom has one proton in its nucleus that is attracting the bonding pair of electrons. 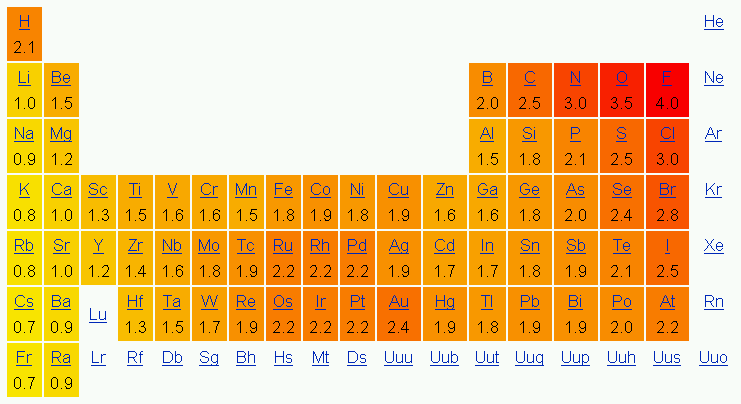 However, the F atom has nine protons in its nucleus, with nine times the attraction of the H atom. The F atom attracts the electrons so much more strongly that the electrons remain closer to the F atom than to the H atom; the electrons are no longer equally balanced between the two nuclei. A covalent bond between different atoms that attract the shared electrons by different amounts and cause an imbalance of electron distribution is called a polar covalent bond. Technically, any covalent bond between two different elements is polar. However, the degree of polarity is important. A covalent bond between two different elements may be so slightly imbalanced that the bond is, essentially, nonpolar. A bond may be so polar that an electron actually transfers from one atom to another, forming a true ionic bond. How do we judge the degree of polarity? Electronegativities are used to determine the polarity of covalent bonds. The unequal sharing of electrons in a covalent bond is usually indicated by partial charge notation as seen earlier, or by a dipole arrow. Dipole arrows depict the unequal sharing by showing the flow of electron density. Dipole arrows have an end with a “+ sign” depicting an electropositive area from which electron density is being pulled, and an end with an arrowhead pointing to the more electronegative atom toward which electron density is being pulled. What is the polarity of each of the following bonds? Using Figure 9.2 “Electronegativities of the Elements,” we can calculate the electronegativity differences of the atoms involved in the bond. For the C–H bond, the difference in electronegativities is 2.5 − 2.1 = 0.4. Thus we predict that this bond will be slightly polar covalent. For the O–H bond, the difference in electronegativities is 3.5 − 2.1 = 1.4, so we predict that this bond will be definitely polar covalent. What is the polarity of each of these bonds? The polarity of a covalent bond can have significant influence on the properties of the substance. If the overall molecule is polar, the substance may have a higher melting point and boiling point than expected; also, it may or may not be soluble in various other substances, such as water or hexane. It should be obvious that covalent bonds are stable because molecules exist. However, the bonds can be broken if enough energy is supplied to a molecule. To break most covalent bonds between any two given atoms, a certain amount of energy must be supplied. Although the exact amount of energy depends on the molecule, the approximate amount of energy to be supplied is similar if the atoms in the bond are the same. The approximate amount of energy needed to break a covalent bond is called the bond energy of the covalent bond. Table 9.3 “Bond Energies of Covalent Bonds” lists the bond energies of some covalent bonds. A few trends are obvious from Table 9.3 “Bond Energies of Covalent Bonds.” For bonds that involve the same two elements, a double bond is stronger than a single bond, and a triple bond is stronger than a double bond. The energies of multiple bonds are not exact multiples of the single-bond energy; for carbon-carbon bonds, the energy increases somewhat less than double or triple the C–C bond energy, while for nitrogen-nitrogen bonds the bond energy increases at a rate greater than the multiple of the N–N single bond energy. The bond energies in Table 9.3 “Bond Energies of Covalent Bonds” are average values; the exact value of the covalent bond energy will vary slightly among molecules with these bonds but should be close to these values. The actual ΔH is −572 kJ/mol; we are off by about 16%—although not ideal, a 16% difference is reasonable because we used estimated, not exact, bond energies. Estimate the energy change of this reaction. Overall, the energy change is +1,047 + (−1,176) = −129 kJ/mol. Covalent bonds can be nonpolar or polar, depending on the electronegativities of the atoms involved. Covalent bonds can be broken if energy is added to a molecule. The formation of covalent bonds is accompanied by energy given off. Covalent bond energies can be used to estimate the enthalpy changes of chemical reactions. Give an example of a nonpolar covalent bond. How do you know it is nonpolar? Give an example of a polar covalent bond. How do you know it is polar? How do you know which side of a polar bond has the partial negative charge? Identify the negatively charged side of each polar bond. 4. How do you know which side of a polar bond has the partial positive charge? Identify the positively charged side of each polar bond. 5. Label the bond between the given atoms as nonpolar covalent, slightly polar covalent, definitely polar covalent, or likely ionic. 6. Label the bond between the given atoms as nonpolar covalent, slightly polar covalent, definitely polar covalent, or likely ionic. 7. Which covalent bond is stronger: a C–C bond or a C–H bond? 8. Which covalent bond is stronger: an O–O double bond or an N–N double bond? 9. Estimate the enthalpy change for this reaction. Start by drawing the Lewis electron dot diagrams for each substance. 10. Estimate the enthalpy change for this reaction. Start by drawing the Lewis electron dot diagrams for each substance. 11. Estimate the enthalpy change for this reaction. Start by drawing the Lewis electron dot diagrams for each substance. 12. Estimate the enthalpy change for this reaction. Start by drawing the Lewis electron dot diagrams for each substance. H–H; it is nonpolar because the two atoms have the same electronegativities (answers will vary). Other Aspects of Covalent Bonds by David W. Ball and Jessie A. Key is licensed under a Creative Commons Attribution-NonCommercial-ShareAlike 4.0 International License, except where otherwise noted.